Apple released the latest version of iTunes, which can be downloaded from Apple’s site or from the Software Updater. iTunes 7.7 includes support for the Apple iPhone/iPod Touch App Store. The update also added many other countries in the iTunes Store list including Saudi Arabia! 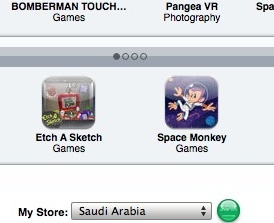 Choosing Saudi Arabia will show you the App Store for the iPod Touch/iPhone. That will probably mean the iPod Touch owners in Saudi Arabia will have access to the 2.0 version of the iPod Touch OS and hopefully soon the official iPhone release for Saudi Arabia. Also on the country list: United Arab Emirates, Qatar (not the European Qatar 😉 ) and Kuwait. Also missing from the list: Bahrain and Oman.